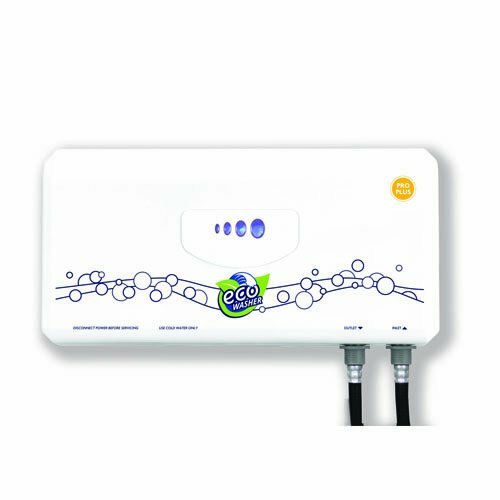 Eco washer is a detergent free laundry system designed to work with your residential washing machine. Ordinary cold water is transformed into a 100% natural, powerful and safe oxidizer that deep cleans, disinfects and deodorizes laundry. Eco washer has been shown through third party testing to ​kill 100% e. Coli bacteria​ within just five minutes, as well as ​severely diminish​ the presence of many other dangerous bacteria. Eco washer quickly pays for itself by reducing costs on hot water, energy consumption, detergent and other toxic additive purchases, and creating an overall healthier lifestyle. Not only will you and your clothing benefit, but so will your washing machine. Toxic residues in your washing machine and wastewater will be annihilated, leaving a smaller footprint on the environment. Laundry is aromatic, appears brighter, and feels softer without detergent, fabric softener or hot water.